Spies are everywhere these days, from the 10 Russian agents nabbed recently here in the United States to the more glamorous Hollywood variety, such as is Angelina Jolie. In the movie Salt, Jolie plays Evelyn Salt, a CIA officer accused of being a Russian spy. With so many secret agents--both real and fictional--these days, we thought it might be helpful to examine a short list of modern-day high-tech spy gear. After all, who knows when you'll need invisible ink, or a code to pass messages in, or just the right bag to swap in a stairwell? But before we get started on our surveillance, we must offer a big disclaimer about this collection of sneaky hardware (and software): Using any of this spy gear may be illegal or unethical, depending on how and where you use it. If you're unsure, check the laws in your state and consult your conscience. By linking to the Websites hosting additional information about the products mentioned in this article, we do not mean to endorse them. To view an abbreviated, slideshow version of this article, see "Spies Like Us: Spy Gear for Your Inner Secret Agent." In this story you can click any of the images below to enlarge it. What do these household items have in common? They're bugged! 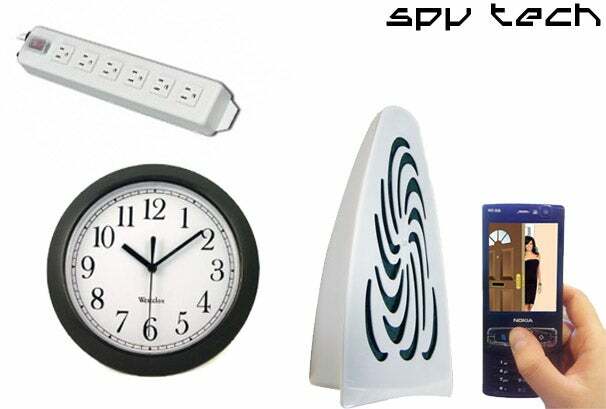 The Small B/W Wall Clock Camera, model C1390B24 (lower left, $276) has a black-and-white camera hidden inside, while the Air Freshener 3G Camera, model CX300MC-A (lower middle, $720) has a color camera inside plus a SIM card that lets you watch the live video feed on a 3G phone. The Power Strip Hidden Audio Monitoring Device (upper left, $1209) is also rigged with a SIM card and a microphone, so you can dial in and listen to conversations. For $100 more, you can get a version that calls you when it detects voices in the room. Tiny cameras that record on the sly can be hidden in all sorts of objects. 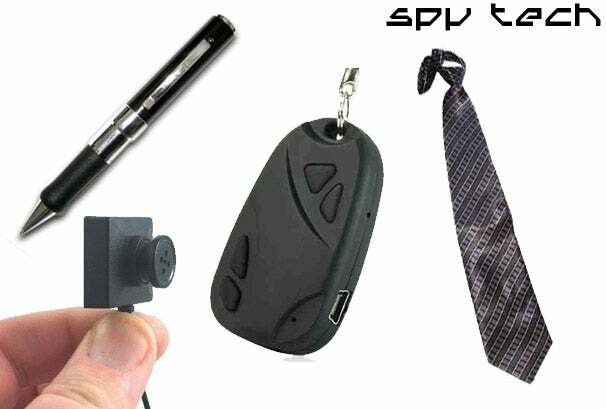 Here we see (left to right) we seethe Spy Pen Camera ($30), which lets you download 640-by-480 video and audio recorded on the built-in 4GB memory straight onto your computer; the Button Camera ($129), featuring three styles of button covers with matching real buttons for the rest of your jacket or shirt; the Key Ring Spy Camera ($102) with built-in microphone; and the dressy Tie Camera ($252), which can share a power supply with the optional Covert Video Recorder ($389). Need to scramble a cellular signal and thereby render nearby cellphones' calling capabilities useless, so your evil-empire nemesis can't deliver his latest intelligence update to the homeland at the appointed hour? The High Power Portable Jammer (left, $205) isn't covert, but it can scramble signals at distances of up to 60 feet away. The 3G Mini Cell Jammer (right, $199) promises to scramble cell signals for 3G, UMTS, CDMA, and GSM networks within a range of up to 32 feet. When you can't crack the encryption code on some secret plans locked away in a computer file, your only other option is to identify the user's password and use that to access to the information in unencrypted form. That's when spies (and paranoid spouses) turn to keyloggers, which record every keystroke that a user enters on a specific computer. The PS2 Keylogger (upper left, $71) works with older keyboards, while the KeyKatch USB keylogger (right, $130) connects between the keyboard cable and a USB port on newer computers. Ultimate Keylogger software (lower left, starting at $26) can monitor not only keystrokes, but also applications and visited Websites. 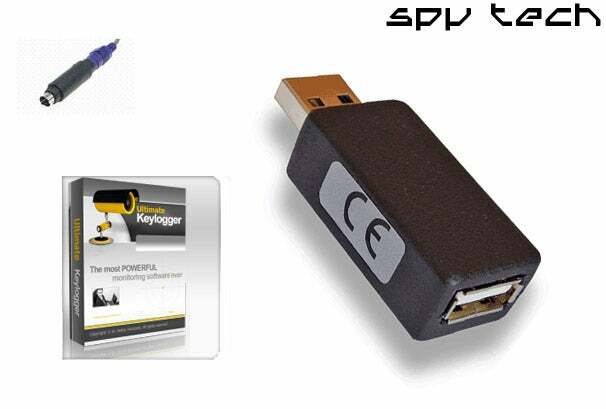 The Ultimate Keylogger program can also send encrypted activity reports via e-mail.